How to draft a proper Job Acceptance Letter letter to your new boss? Download this politely drafted Job Acceptance Letter template now! 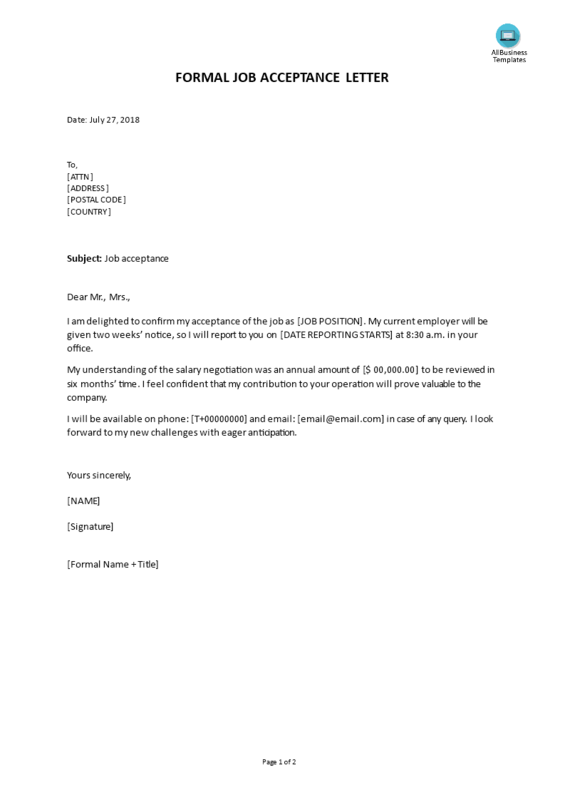 If you wish to send a proper confirmation letter to the company that just did you a job offer, we recommend you to check out this Job Acceptance Letter. This message will capture your receiver's attention for sure! It also informs about a 2 weeks delay because of a 2 weeks notice that is applicable at the current job. The right stimulation will help you to achieve mutual goals faster and will benefit your results! After downloading and filling in the blanks, you can easily customize e.g. style, typography, details, and appearance of your letter. Download this Job Acceptance Letter template now and send it out today!